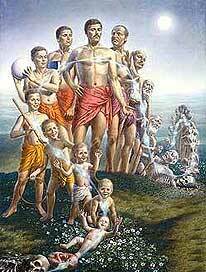 Reincarnation, literally "to be made flesh again", is a doctrine or metaphysical belief that some essential part of a living being (in some variations only human beings) survives death to be reborn in a new body. This essential part is often referred to as the spirit or soul, the "higher" or "true" self, "divine spark", or "I". According to such beliefs, a new personality is developed during each life in the physical world, but some part of the self remains constant throughout the successive lives. Belief in reincarnation is an ancient phenomenon. This doctrine is a central tenet within the majority of Indian religious traditions, such as Hinduism (including Yoga, Vaishnavism, and Shaivism), Jainism, and Sikhism. The idea was also entertained by some ancient Greek philosophers. Many modern Pagans also believe in reincarnation as do some New Age movements, along with followers of Spiritism, practitioners of certain African traditions, and students of esoteric philosophies such as Kabbalah, Sufism and Gnostic and Esoteric Christianity. The Buddhist concept of Rebirth although often referred to as reincarnation differs significantly from the Hindu-based traditions and New Age movements in that there is no "self" (or eternal soul) to reincarnate. Pythagoras a Greek philosopher and mathematician, taught that the soul was immortal and merely resides in the body; therefore, it survived bodily death. His further teachings held the soul goes through a series of rebirths. Between death and rebirth the soul rests and is purified in the Underworld. After the soul has completed this series of rebirths is becomes so purified that it can leave the transmigration or reincarnation cycle. During recent decades, a significant minority of people in the West have developed a belief in reincarnation. Feature films, such as Kundun and Birth, contemporary books by authors such as Carol Bowman and Vicki Mackenzie, as well as popular songs, regularly mention reincarnation. Some researchers, such as Professor Ian Stevenson, have explored the issue of reincarnation and published evidence of children's memories of earlier lives. A minority of Skeptics are critical of this work and say that more reincarnation research is needed. American mystic Edgar Cayce promoted the theory of both reincarnation and karma, but wherein they acted as instruments of a loving God as well as natural laws - the purpose being to teach us certain spiritual lessons. Animals are said to have undifferentiated, "group" souls rather than individuality and consciousness. Once the soul evolves through a succession of animal incarnations and achieves human status, it is not then reborn in animal form. Cayce's view arguably incorporates Theosophical teachings on spiritual evolution. Eckankar offers a mix of Eastern and Western thought and reincarnation is a basis of this teaching. It teaches that the soul is eternal, and that it either chooses an incarnation for growth, or that an incarnation is given to it because of Karma. Similar to early Christian thought from the philosopher Origen, Eckankar postulates that the soul is perfected through a series of incarnations until it arrives at "Personal Mastery". Seth, a discarnate entity purportedly channeled by the psychic Jane Roberts from 1963 to 1984, said that both humans and animals reincarnate, after which they move on to other planes of existence. He said that time is a "root assumption" of the physical plane, and that all lives are actually lived simultaneously in a "spacious present" which includes all past and future events. According to Seth, humans are multi-dimensional beings who have inner selves, outer selves or egos, and dreaming selves (among others). With each new life, a new outer ego is born which, when it dies, becomes part of the gestalt of souls which constitutes the entire self. "I adopted the theory of Reincarnation when I was twenty-six. Religion offered nothing to the point. Even work could not give me complete satisfaction. Work is futile if we cannot utilise the experience we collect in one life in the next. When I discovered Reincarnation it was as if I had found a universal plan I realised that there was a chance to work out my ideas. Time was no longer limited. I was no longer a slave to the hands of the clock. Genius is experience. Some seem to think that it is a gift or talent, but it is the fruit of long experience in many lives. Some are older souls than others, and so they know more. The discovery of Reincarnation put my mind at ease. If you preserve a record of this conversation, write it so that it puts men's minds at ease. I would like to communicate to others the calmness that the long view of life gives to us." There are people who say they remember their past lives and use that knowledge to help them with their current lives; the belief in this kind of occurrence is central to the New Age movement. Some of the people who remember, say they simply remember without any effort on their part. They simply "see" previous times and see themselves interacting with others, occasionally even different creatures besides people themselves.